Developing iPhone application on windows is possible! 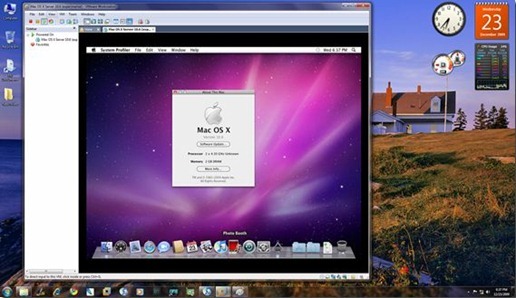 You can easily install MAC OS X Snow Leopard and then Xcode on Windows 7 , deploy your iphone/ipod application on jailbroken iphone/ipod. I installed Mac OS X Snow Leopard on my Sony Vaio E series which has Intel i3 Proc. , 3GB Ram, 512MB graphic card. Snow Leopard works smoothly and Xcode too!, successfully deployed my application on my jailbroken Ipod-touch which has Iphone firmware 3.1.3. If you have an upgraded firmware i.e higher than 3.1.3 then you will have to Google and find out the latest version of RedSnow or any other tool to jailbreak. This is the only version of Iphone SDK in which which works on Mac OS X v10.6 , please dont upgrade your mac after you installed Mac in Vmware. *If you cant download in windows, try downloading in MAC or search for torrent. You should remove code signing which makes possible to deploy your Iphone application on real jailbroken Iphone/Ipod i.e without ADC membership, but you cant host your Iphone Application on Apple Appstore! . This tool lets you connect /share folders from windows and mac and few other utilities.